It was Sept. 5, 2014 and the Bingham High football team was on the road in Las Vegas facing one of the nation’s top-ranked teams. Trailing by three points, after giving up possession late in the fourth quarter, Bingham got one unexpected last chance. There was not time to drive for a game-winning touchdown, but fortunately for head coach Dave Peck, he turned to Chayden Johnston. On the final play of regulation, the senior kicker drilled a 47-yard field goal to force overtime. On the road…in a hostile environment…against a top-of-the-line opponent. The night did not end as happily for the Miners, who lost the contest in overtime, but it was another memorable moment for Johnston. The little kid in the soccer shin guards has come a long way in four years. 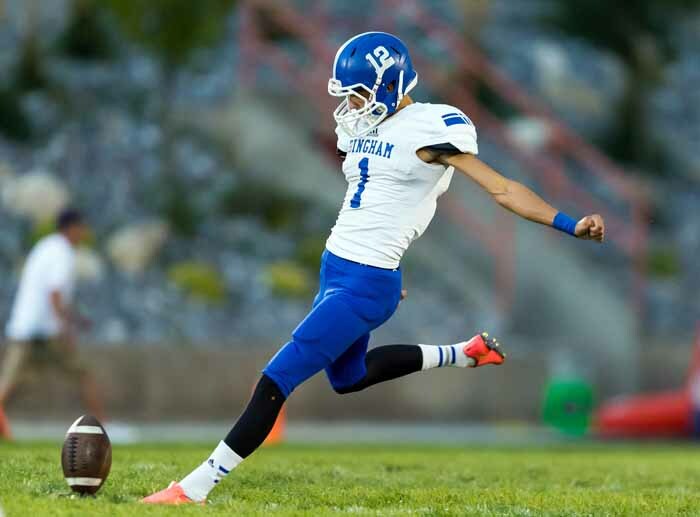 Once he discovered the American version of football, the young man turned his skills into a college scholarship, as he has committed to kick for The University of Utah after he finishes at Bingham. Not bad for someone who didn’t even like the game. At the time, Johnston was of the same mind as his teammates from club soccer. They were headed to play high school soccer at Copper Hills. But that school’s loss has been Bingham’s gain, and while he did stay with soccer through his junior year, football discovered a star that day. It was not the first time the coach had heard from the father of an incoming freshman about his son’s abilities. This was one of the times that the parent was spot on. “I get calls all the time and I say, ‘Yea, I’ll bet you can. '” Peck said. He didn’t look much like a football player, but once Johnston figured out how to dress for workouts, the Miner coaching staff quickly discovered that another placekicking star had arrived on campus. The Miners are used to having star kickers, so they don’t get overly excited when another young one comes along, but Peck knew early on that Johnston was special. 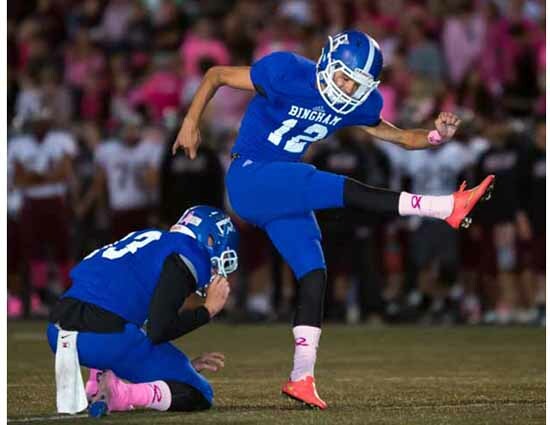 There are a few reasons for the great kicking tradition at Bingham High. Peck thinks it starts with the fact that the Miners have a coach focused on that area. In addition to having a dedicated coach to work with him at practice and during the offseason, Johnston also benefits from his attendance at all kinds of events focused on the kicking game. Some of that starts right at home, as the great ones help build the tradition of great kickers in the Miner program. Johnston has benefited from his association with past players and he is already working to pass it on the next group of specialists. There is a certain reputation that comes with being a kicker, but even though he came from soccer and did not grow up as a football player, Johnston is not a fan of that negative stereotype. He just wants to be like everyone else on the team. “I didn’t know about the reputation of being a kicker until I was a kicker,” he said. “I said, ‘Man I hate this. 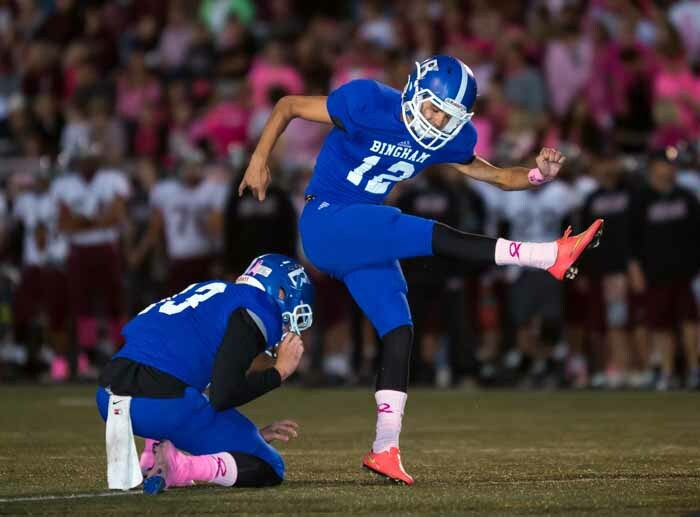 This is stupid.’ So I just decided that my goal throughout my whole time here at Bingham was to try to change that reputation about how we think about kickers, the ones that are sitting over on the sidelines eating popsicles at practice. That’s the reputation you get. Peck believes that attitude helps immensely in making Johnston the success story he has become. This is a kicker who thrives in the most difficult circumstances, as evidenced by his performance in that September game in Las Vegas. 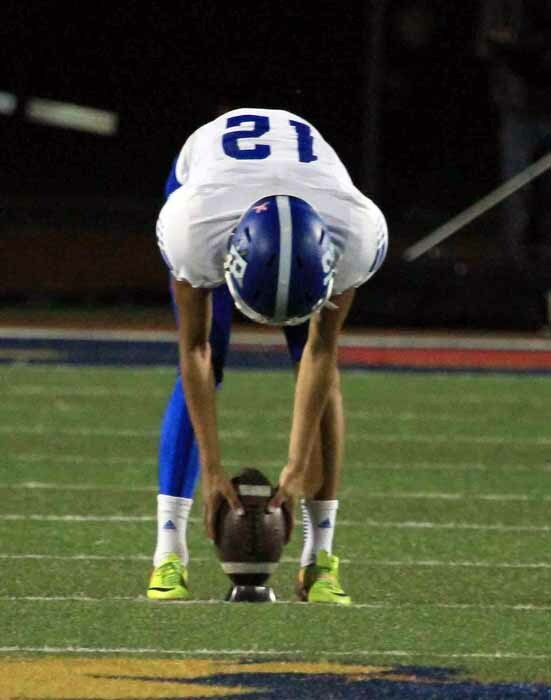 Outside of the Bishop Gorman game, there haven’t been a lot of chances for Johnston to kick in tight situations the past couple of seasons, but with his accuracy and length, Peck is extremely confident in his kicker even in teeing up a long one. His career long is 52 yards, and Johnston feels like his range goes out to about 60. Timing is a big part of everything in football, and with onrushing defenders looking to turn around every kick before it clears the line of scrimmage, it is of particular importance in the kicking game. Johnston credits much of his success to the timing that comes from having a great long snapper, sophomore Brigham Tuatagaloa, who Peck describes as the best Bingham has had in his years on campus. Johnston’s come a long way since those days as a small soccer-playing eighth grader. His transition to kicking an American football came quickly as the game seems to fit him perfectly. Thank goodness for small feet.